"I only have this one life. I only have this one body." I have always thought that was such a sad thought. For her, death is such a finality, the end of it all. That is not how I see death at all. Until a few years ago, I had no interest whatsoever in politics. Then, during the last Image via WikipediaPresidential campaign, a politician emerged who looked like me, who said the things that I believe, who seemed to understand how I felt about our country. A small spark ignited in my brain and became a huge flame of love for the knowledge of how our country works, where we came from and where we are going. As a matter of fact, as I write this, I am watching live streaming of the poll results from the primaries of several states. Glen finds my new interest in politics (and also with the start of a new football team at our local university, a new love of college football), quite amusing. While traveling down the road the other day, we were discussing how different my life might have been had I found this interest much earlier in my life. I have a love of writing and of public speaking. I am much more comfortable in front of an audience of one hundred people than I am with just one person. To speak in a way that causes an audience to respond a particular way is an exhilarating experience. Those traits could go far for someone entering the political arena. But it is too late for that now, and besides, my life has taken a different path. We continued down the road and the orange light from the setting sun filtered through the trees. The soft peach colored clouds and blue sky gave me a sense of comfort. The thought came to me that there is more to life than just this life. The very essence of that statement struck me. There is more to life than just this life. There will be a thousand years here on the earth when our Lord will rule and reign. The Scriptures tell us that those of us who are His children will rule and reign with Him. My love of politics, of public speaking and the joy of communicating may be something honed here for use there. I don't know for sure, but I do know that nothing is wasted and nothing is by chance in our Lord's economy. How exciting to know that I don't have to look at death as the end. I don't just have "this one life". I have this life in this body and I have all of eternity to be whatever it is He desires me to be. As the cartoon character says, "To infinity and beyond!" Today we passed by an antique shop. Only the rounded side of the building hints that Image by theloushe via Flickr at one time it was a roller rink. I didn't need to look at it to be reminded, because it was the site of many painful childhood memories. As a child, my mother would take me or send me to roller-skating birthday parties at this place. The only problem was, I didn't know how to roller skate. I would cling to the side of the rink, hanging tightly to the rail as my friends whizzed past me, their giggling and laughing floating in the air beside me. My legs were as wobbly as a newborn colt's. I was petrified of falling down, not realizing that clinging to the rail was as humiliating as landing on the floor. I would sigh with relief when it was time to sit down for cake and ice-cream. Never in all my childhood did I master the skates. Later, at nineteen, I was determined to teach myself to skate, perhaps to redeem myself from the humiliation of the past. My husband, then my boyfriend, worked at the Christian Life Center of our church. Between the time our skating center was open for members and the time it was reserved for visiting churches to be "locked-in", he would let me have the skating area to myself to practice. 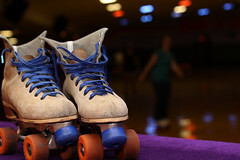 Each night, in solitude, I spun around the gym, finally being willing to fall in order to skate. There, all alone, I could fall without anyone to see and more importantly, laugh. Finally mastered the eight wheels that tortured me as a child. I don't know what the point is in telling you this story, except that I know the Lord worked that childhood humiliation into my life in some way and shape to make me into the person I am today. In fact, it helped to form me into the young woman who was so determined to teach herself to overcome her inability to skate. Sitting on the cold gym floor that night with the two prominent preachers looking down at me did not return me to the humiliated spot I knew as a child. Instead, I got up and started skating once again. I was determined to master the skates and not have them master me. Staying on the floor was not an option. Sometimes when we make mistakes in our walk with Lord, our tendency is to want to "stay on the floor". We think we can never master the skates, or we cling to the rail never having the nerve to live by faith and let go of the rail. But the Lord wants us to be skating out in the gym, not clinging to the wall, or sitting of the floor. I have heard a great preacher say that if we could audibly hear the Holy Spirit speaking to us when we fall and make mistakes we would most likely hear Him say, "Get up!" Maybe He would tell us, "Keep skating!" Forty-seven years ago, after an evening out with some friends, the yellow and green shag carpet of my bedroom crumpled up under my knees as I knelt beside my bed, but I didn't feel it. I don't remember what drew me to my knees and I don't remember what I said as I knelt there in prayer, but I remember how I felt as I stood up. I had grown up in church. My grandparents were both Salvation Army officers so my mother made sure that all of us were in church each Sunday. From the eighth grade I attended a very strict Christian school in which memorization of large portions of Scripture were a required part of the curriculum. I am sure my school history and my church history is why I am now familiar with large portions of the Bible and so many of the old hymns. As a youth I witnessed for my church and gave my "testimony". I remember sitting up in the holly tree by our driveway carefully writing my "testimony" that I was to give later in a Youth Service at church. I suppose I had to write it all down, because I surely couldn't give it from the heart. In my head, I knew the truth of the Lord Jesus and I would say it was truth, even that I believed it. But it had never made it into my heart to change my life. Yes, I had once prayed that God would save me from burning in hell, but that was not the prayer that was needed. In later years, my heart began to be bitter and to love rebellion. My sister has always called me a "non-conformist" and I would rebel against authority for the sheer enjoyment of the rebellion. Enrolled in a school with extremely strict rules, I was often used by the teachers to set an example of what happens when you break the rules. My dress hem was often ripped out (because my dress was too short) and my makeup (forbidden) washed off. Needless to say, I saw the Principal's office often. Then on August 19, 1973, the truth of the God Jesus Christ becoming the man Jesus Christ and dying for my sins sunk into my heart. It took me to my knees in the quiet of my own bedroom and I arose from that spot a new creature. My heart was completely different from the person who had knelt there before and I knew it to be so. I no longer wanted to defy the authorities in my life, but I had a true desire to obey. The teachers at school immediately noticed the different attitude and I was glad to tell them that I had gotten my heart "right with God." It has been a long path these thirty-seven years. Sometimes the path has been through the darkest of night. Sometimes it has been on the high mountain tops. Sometimes it has been through the driest desert. Sometimes I have willfully walked my own way and had to stumble back into merciful and loving arms waiting for me. But all the while, I have known that on that day in August 1973, I was made a "new creature". There was something birthed in me that was as unshakable as the birth that occurred to me in September of 1957. So yes, my birthday is in two weeks, but no, my birthday is today. Last time I posted about how the Lord will remember our sins no more. The Scripture doesn't say He forgets our sins, but rather that He doesn't remember them. At first glance that may seem to be one and the same, but it isn't. He chooses not to remember. I was pondering this thought and I remembered how the Lord gave Moses the pattern for the tabernacle in the Mountain. The tabernacle has always been a special type and picture of the Lord Jesus to me because when I was a senior in high school, we were divided into teams of two and each team had to present a scale model of the tabernacle for a grade. We had to follow the "pattern" to get a good grade. Having sewn quite a few things in my years, I am practically acquainted with the concept of patterns. I learned to sew by watching my Aunt Flossie. She had a little room in her house where she would make clothes for her family and she was patient and kind to let me stand and watch what she did. It laid a foundation of knowledge for when I decided to put my hand to the sewing machine at our house. I did what I saw her doing. This is what the Lord Jesus told His disciples. "Verily, verily, I say unto you, The Son can do nothing of Himself, but what He seeth the Father do: for what things soever He doeth, these also doeth the Son likewise" (John 5:19). Perhaps, the Lord inspired the prophet Jeremiah to tell us about the Lord not remembering our sins for that to be a pattern for us. An example of something we should follow. Something we could "see" our Father doing and we could do it likewise. We hear a lot in our day and time about "forgive and forget". While some people don't seem to have difficulty with the "forgive" part, many people have a great deal of trouble with the "forget" part. Perhaps that's because we aren't meant to forget. Instead, perhaps instead we are meant to choose not to remember. Maybe that is the pattern to follow. Lest this just becomes a debate of semantics, let's put it into a practical situation. Imagine I have been wounded by someone, perhaps even a friend. At some point, the remembrance of the offending occurrence is sure to come to my mind. Even if I am determined to keep it from my thoughts, as a Christian, I have enemies -- the world, my flesh and the devil -- who will constantly want to put those very thoughts before me. In fact they will entice me to dwell upon every minutia of how I have been wounded, abused and mistreated. It pains me how often I have followed this enticement when there were such better thoughts to be had. When those temptations come, instead of setting my anchor in that unsafe harbor of remembrance, I can choose to think of what the Lord has said about that situation and about me and the person who offended me in that situation. So what do we think about? What do we know to be true? We know to be true that our sins and the sins of the one who wounded us, were paid for on the cross by the blood of the Lord Jesus. If our friend is a Christian, even if they have walked after the flesh in this matter, their names and our names are written in the Book of life and we are heirs according to the hope of eternal life by the promise of His dear Son. We know, too, that we are in Christ and He is in us. We are seated in the heavenlies, hid with Christ in God. Nothing can harm us or touch us except the Lord chooses to work it in our lives for our very good. We know the Lord has blessed us with all spiritual blessings and as already given to us all things which pertain to life and godliness. We know because He has made Christ to be for us wisdom, righteousness, sanctification and redemption, through Him we can do all things, including forgiving the one who has wounded us. We know too, that Christ is our peace and joy and that the love wherewith He loves us passes knowledge. This love is shed abroad in our hearts by the Holy Spirit. We know we can rejoice in the comfort of love to be ours in the Son of love, and that the Lord has given to us the Spirit of power and of love and of a sound mind. As we begin to confess these things to be true, we will find our hearts more at peace and our minds focused not on our wounded self that is hurting and reeling but on His wounded self which is healing and redeeming. Yes, I Remember it Well. . .
Honore: That's right. That's right. Memory is a mysterious thing. I remember very little about my childhood and I wonder if the few things I do remember are things I really remember, or do I remember being told about them? I have some memories of elementary school, none of which are really those warm, fuzzy things we like to remember. Rather, the things that other kids inflict upon us that we would like to forget but that stay with us all our lives. My memory doesn't really gel up until high school and even then things are blurry. Having said that, there are things I can remember with perfect clarity. The day, as a six year old, I put my favorite little blanket on the garbage can outside. I stood in the storage room and watched the garbage men carry it away. I remember as a child finding a forgotten Christmas present late one Christmas afternoon and then having the glee of finding out it was for me. I remember my wedding day as if it was yesterday, and the day that each of my children and grandchildren were born. I even remember the day sweet little Sparrow came to be a part of our family. So how come when I walk to the other end of the house, I can't remember why I walked in there?
" And they shall teach no more every man his neighbour, and every man his brother, saying, Know the LORD: for they shall all know Me, from the least of them unto the greatest of them, saith the LORD: for I will forgive their iniquity, and I will remember their sin no more. Jeremiah 31:34"
The Lord will remember our sin no more. He will choose not to remember our sin. The God who made everything and who upholds all things by the Word of His power, will choose not to remember our sins! He does not forget our sins, He chooses not to remember. Why would He do this? He chooses not to remember our sins because the penalty that was paid for those sins was infinitely sufficient. The blood of the Lord Jesus shed upon the cross was completely sufficient to purchase our salvation and justification and the Lord can choose to forget our sins because He laid them all upon His Son. I may have trouble remembering where I put things, or if I took my medicine, but there is one thing I don't have any trouble remembering. There is a Man in Heaven today with nail wounds in His hands and feet and a spear wound in His side because He "became sin" for me. I don't understand that, but yes. . . I remember it well. "For He hath made Him to be sin for us, who knew no sin; that we might be made the righteousness of God in Him. 2 Corinthians 5:21"